Miya - Lovely Product ! After trying nearly all of the PC serums and moisturisers, I've finally found only the second one that doesn't sting my eyes and make them water and blurry all day. The other being Resist Superlight SPF. This is very light on application and feels sort of tight, but this is misleading. It actually provides plenty of moisture. I spent a day in a freezing cold wind, having applied only a small amount and there wasn't a hint of dryness or tightness. It actually seems to moisturise more throughout the day without getting shiny. It's pretty calming on the skin too. My redness prone cheeks are behaving themselves really well! The smell is lovely and oatmealy - very pure and homely. If you are like me and suffer with very sensitive eyes, it's definitely worth trying a sample. I've come from being a lover or organic/natural products to a PC devotee. I really wanted this to be My Cream, but just bought it and for Autumn it's not enough for my dry skin, even when layered with my PC serum. It is a lovely cream, and I think it's better for dry skin in summer, or at least not skin as dry as mine. I would really recommend it for sensitive skin though, because it is comforting, gentle and calmed my redness. I'm giving it 4 stars because it's a good cream, silly and smooth, but it sinks in very quickly and leaves my skin wanting more. 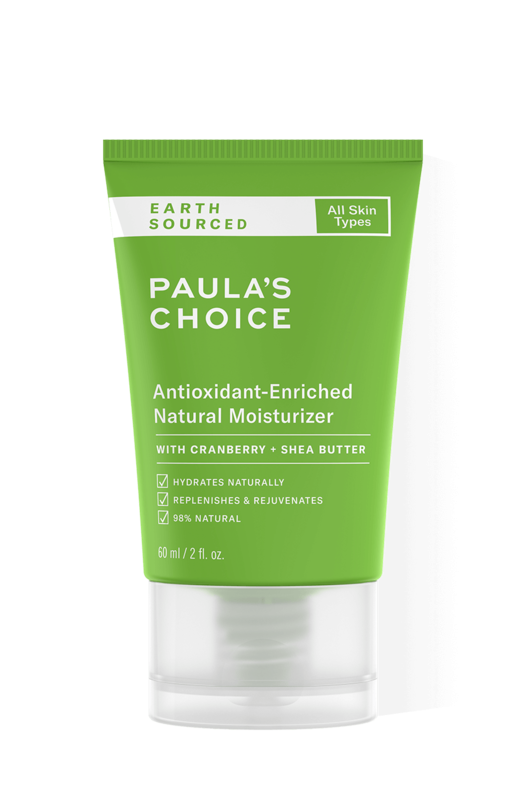 I really hope Paula and her team develop her Earth Sourced range for people with dry skin as she would be able to steal lots of organic loving customers from the brands who fill their products with irritating essential oils. Hint hint. My skin is extremely sensitive and dry, and I have problems with eczema and rosacea. Since this product advertises to alleviate some of those problems, I was really hoping it would do the job, but it actually feels as if it has dried my skin out further. My skin is drier and more irritated than before. I did order a sample a few months back, and I didn't have any problems with it. But since then, my skin has become extremely irritated (not because of the product), and instead of helping, it has made it worse after about two weeks of use. I was very disappointed. This moisturiser *is* very light, so I think it could be good for people with combination or oily skin. jane - Good natural moisturizer. I quite this moisturizer. It has a pleasant texture and natural smell. The moisturizer feels really moisturizing at first when applied, but it soaks in quickly and leaves a semi-matte finish behind. It does feel a little more sticky than my usual moisturizer, which I suspect is due to the lack of silicones. If however, you are looking for a natural moisturizer then this one is a great choice. I bought the three products of the Earth Sourced line and started using them, replacing the other cleansers, moisturizer and toner from PC. It all seemed to work very well for the first ten days or so. I was quite satisfied. However soon I began to have small bumps resurfacing all over my face and neck, which became really angry and horrible. I've had allergic reactions to some skin products before, but never something like this, it was very strange and very, very upsetting. These three products were the only change in my routine, including make up products. So finally I realized it mus be these new products, some ingredient(s) in them must have triggered something on my skin. Eventually I had to go to the emergency room and use hydrocortisone cream to calm something that according to the doctor looked like rosacea. I had never had rosacea before in my life! My skin is still slowly recovering. So sad since I was really looking forward to using these products and had high hopes for them working for me. Fortunately customer service was quick to reply and refunded me promptly. Very, very disappointed. Customer care : Thank you for your review. We are sorry to hear of your experience with this product. While this response is not typical, we do understand that each customer is uniquely different in how they will respond to products or ingredients. This along with everyday environmental factors can sometimes play a part in how someone will ultimately respond to a product or combination of products. I am so dissappointed with this moisturiser, I was really excited about this range thinking that these products would really help my rosacea, I was wrong. The cleanser really dries out my skin and makes it red, then the moisturiser just leaves a layer on my skin and burns like crazy. My skin is now worse than before. I am so annoyed that I had to purchase the full sizes as there are no sample sizes. I have wasted my money. Customer Care: Thank you for your review. We do suggest not using this product any longer if you notice stinging when applying it. While the response you have indicated is not typical, we do understand that each customer is uniquely different in how they will respond to products or ingredients. This along with everyday environmental factors can sometimes play a part in how someone will ultimately respond to a product or combination of products. In the meantime, we have refunded the purchase price of this product to your account.